By Thierry Vircoulon and Thibaud Lesueur By failing to engage when Crisis Group and others warned that the Central African Republic had become a phantom state, the international community has now had to become much more heavily involved, at much greater expense, after horrifying loss of life and massive displacement, with much greater odds of failure. The new CAR government (the third in one in a year) looks promising and the capital, Bangui, enjoys slightly more security. Yet the international response continues to be riven by divisions, most notoriously between the African Union and the UN. CAR’s new president has called for a UN peacekeeping mission and Chad, an important regional player which initially opposed this option, now agrees. The Security Council has itself approved a European Union mission, soon to be deployed. But peacekeepers (EU and otherwise) must be guided by a stabilisation strategy that is coherent, comprehensive and meets the needs of CAR not just in the short-term but over the long haul. Since the end of January, the conflict has spread from the capital, Bangui, to the provinces. In Bangui, the anti-balaka groups have replaced the Seleka fighters – the majority of the victims of violence in the capital are no longer Christians but Muslims. Confessional violence and crime is now the norm and revenge is a dominant impulse in the country. 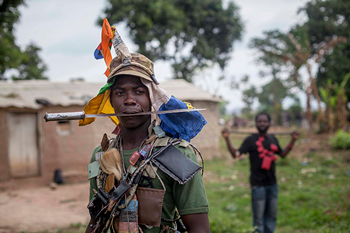 In the provinces, militias are establishing territorial control: most of western CAR has fallen to anti-balaka militia who are pushing away Muslim communities, while Seleka fighters control the northeast. There is an exodus of Muslims to safe areas, including Chad, Cameroon and the eastern part of the country. All this risks a de-facto division of the country along religious lines and between armed groups, with new groups likely to emerge soon. The arrival of the new president, Catherine Samba-Panza, and her government is a welcome development, particularly given that her ministers are more technocratic than they are tied to militias (whether ex-Seleka or anti-balaka). Her comments recently on the importance of justice to reconciliation are welcome too, particularly given currents elsewhere on the continent. Some steps toward law and order have been taken in Bangui, including arrests of some anti-balaka by peacekeepers. However, as mob violence increases in Bangui (last Saturday afternoon, three Muslims were lynched there), peacekeepers need more policing and crowd management capacity – something that the French Operation Sangaris (with 1,600 troops deployed in and around Bangui and 400 more on the way) and the 5,000 African-led troops in the International Support Mission in CAR (MISCA) still do not have. Such policing resources need to be deployed urgently, even before questions of ultimate mandate – whether AU or UN-led – are resolved. French and MISCA forces also need to deploy in key towns outside of Bangui before the rainy season begins in April. This, too, cannot wait for a final decision on whether the mission is AU or UN. International forces need to facilitate the delivery of humanitarian aid into the hinterland, to free provincial capitals from militias and thus to enable the transitional government to establish its authority, and its credibility, throughout CAR. MISCA and French troops have indeed been escorting trucks, including ones bearing humanitarian aid, along the main trade road between Bangui and Cameroon. But for the most part the country outside the capital is lawless. Both anti-balaka and Seleka fighters prey on civilians; they should be disarmed and brought into a far better reintegration program than those in the past (five by our count). In the last few months, there has been considerable focus on troop deployment to end the violence and the humanitarian disaster. But the CAR effort, like others in the continent’s conflict zones, is falling victim to bureaucratic wrangles, capacity deficits and struggles over turf between its international partners. MISCA is short of troops and resources; re-hatting some forces to the UN would be difficult given concerns over some of their human rights records, apparent bias and high level of unpopularity. Meanwhile, mobilising the small European mission has been difficult, and the spat between the AU and UN on who should be responsible for peacekeeping in CAR – when both need to work together to define responsibilities – merely distracts attention from securing the country’s recovery. Some anti-Balaka militias are allegedly linked to former president François Bozizé and his entourage in Cameroon and France. Ties between the anti-balaka and Bozizé should be investigated and, if proved, appropriate action should be taken, including consideration of criminal investigation. It is essential that as CAR security forces are gradually reconstituted, they are vetted fully and monitored – particularly given reports that some former soldiers have joined the anti-balaka ranks and been involved in attacks on Muslims – and that they include in all ranks individuals from all groups and regions. Competent international police monitors should patrol jointly with national police but, given the past record of state security forces, their reconstitution requires significant and long-term training and capacity building by international actors. Security sector reform must be high on the agenda, but only after careful analysis of previously failed efforts. Relations between Muslim and Christian communities have deteriorated dramatically, as seen recently when a representative of the National Transitional Council was shot dead in Bangui after he appealed to the population to denounce violence against Muslims. The anti-balaka have been targeting Muslim neighbourhoods with a barely hidden cleansing motive: in the Berberati and Nola neighbourhoods, for example, they destroyed shops owned by Muslims as the latter fled in anticipation of anti-balaka militiamen’s arrival. International troops will need to use all necessary force to halt those attacks, but this has implications for the peacekeepers. Chadians, in particular, are seen as aligned with the Seleka and stand accused of complicity in the group’s violence, which would complicate their rehatting under UN command. Measures to rebuild confidence between communities are essential. The imam, the archbishop and representatives of the other Christian churches in Bangui have been working closely with each other, but this is limited to the capital. An interfaith dialogue and a reconciliation campaign should start at the grassroots level and be expanded to the provinces with the support of the transitional government and CAR’s international supporters. At this stage, the absence of prominent politicians in reconciliation efforts is highly disturbing. Human rights monitoring, with publicly available reporting, and investigations will be essential to reconciliation, as President Samba-Panza has said. Just recently a new mass grave was found in a former Seleka camp in Bangui. Those responsible need to be identified and held accountable. The economy also needs emergency repair. Economic development is usually a long-term goal, but in CAR it needs to be at the centre of international efforts. The country’s collapse is largely the result of decades of neglect and decline, with its socioeconomic indicators the worst on the continent. Job creation, in particular finding something productive for youths in Bangui to do, is vital. Labour-intensive programs should be put in place to fix water and sanitation systems before the rainy season gets under way in April. This would provide an important short-term dividend for the new government and could contribute to stability in Bangui and other cities. Donors should be careful to focus not just on macroeconomic management but on the day-to-day economy of the poor. Major decisions will be made in the next six weeks. On the 25th France’s Assembly will discuss CAR. A few days later UN Secretary-General Ban Ki-moon is expected to deliver to the Security Council his report on CAR, which will focus on the possible transformation of MISCA to a UN-led peacekeeping mission. France is then expected to table a resolution creating such a force. Meanwhile, fact-finding missions are thick on the ground in Bangui. A Turkish team arrives this week and European ministers will arrive in the middle of next month. Nearly one year has passed since the March coup that led to CAR’s current descent into chaos, and the crisis has moved rapidly from Bangui to the provinces. Most worryingly, what was primarily a political conflict – driven by poverty, bad governance, corruption, underdevelopment and inequality – has taken on ugly religious overtones, making conflict resolution and recovery all the more difficult. This is the third transitional government in a year. The timeline of a year to the next planned elections is unrealistic and dangerous. There are obvious risks in rushing to a vote in a country with as troubled an electoral history as the CAR, particularly now in the light of recent intercommunal divisions, armed groups’ territorial control and massive population displacement. Regional and international actors should be prepared to support a longer transition and the transitional government should focus on reconciliation, improving security and making state services effective. These are the foundations for a decent electoral process. As soon as the security situation permits, the new president should travel to the provinces to signal the country’s normalisation and to restart state services.